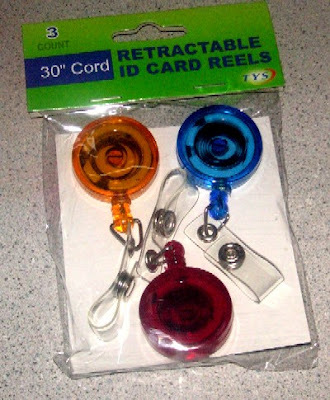 As mentioned previously, I like to keep Rolodex 3"x5" compatible cards available as one of my Ubiquitous Capture strategies. 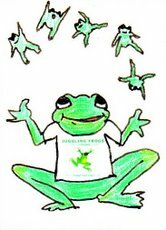 3"x5" cards have a real following. Check out Merlin Mann's Hipster PDA or DIY Planner's templates. Some people even get a bit carried away with them, turning capture into full-throttle pursuit! Here are a couple of card holders I've made. One is for placing near telephones, and the other is for use in the car. 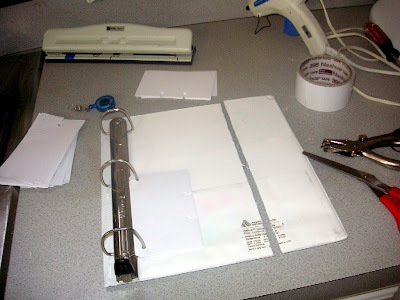 To make the phone note holder, I cut the front cover off an inexpensive plastic index card binder and attached strong magnets to its back with a hot glue gun. 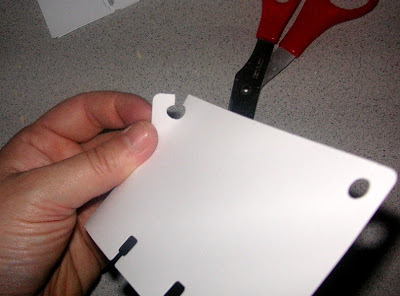 The holes in the index card binder are spaced the same as a standard (American) 3-hole punched 8.5"x11" page. 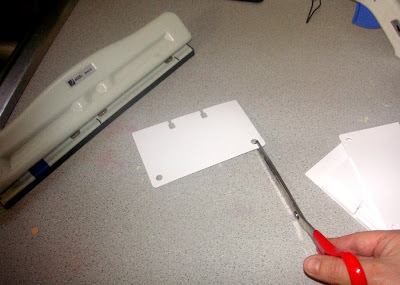 For Rolodex compatible cards , I used the top two holes of a standard 3-hole punch. 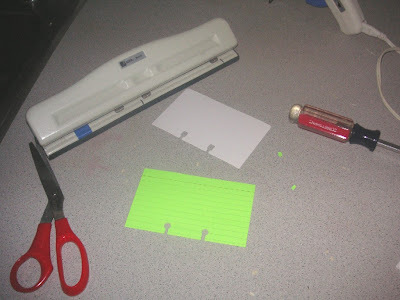 To help line up the cards, I marked where the edges go with a permanent marker. 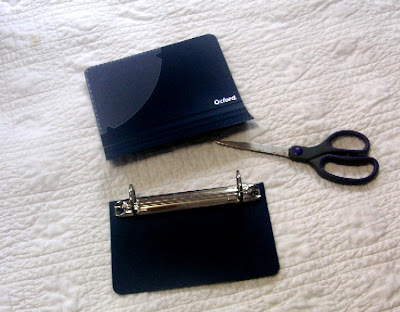 To facilitate quick use of the cards, I snipped them with a scissors from the edge of the card to the top of these holes. 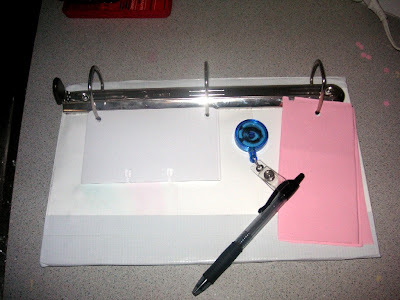 This allows the cards to slip in and out of the binder, without opening the binder's rings. 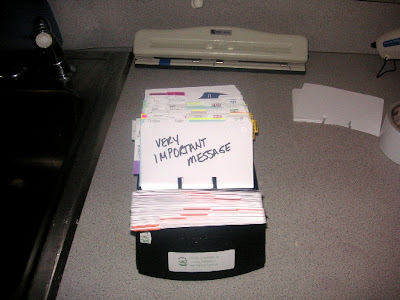 Rolodex cards are much more expensive than plain index cards, and they don't come in as many varieties and colors. 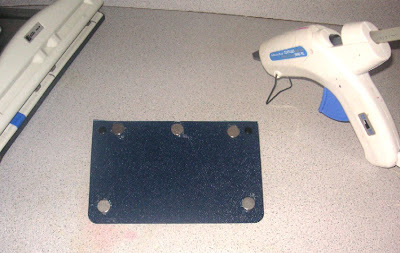 To convert regular index cards to Rolodex-compatible cards, I moved the third hole of the standard three-hole punch to the width of the holes in a Rolodex card. I used a card as a guide. To make the guideline on this side, I used a small blue piece of electrical tape. 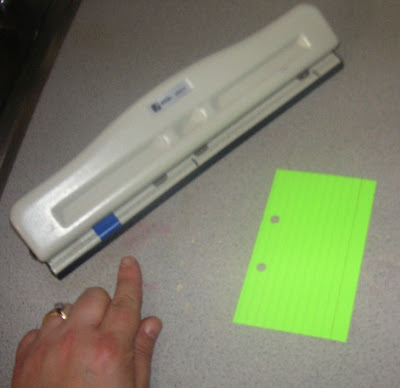 Thus, the same standard 3 hole punch will punch the cards for the binder using the top and middle holes and black marker guidelines, and also convert index cards to Rolodex-compatible using the middle and bottom holes, lining things up with the blue tape. 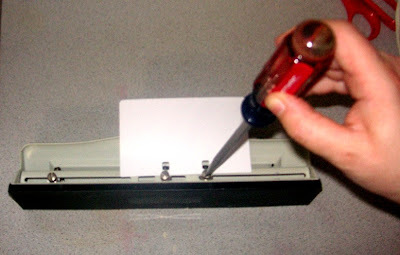 Snipping the card from the edge to the holes makes it fit into the Rolodex device. 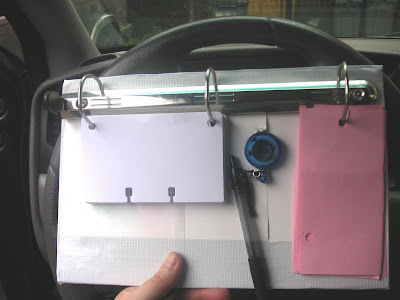 I made the car clipboard from a torn and stained 3-ring binder. 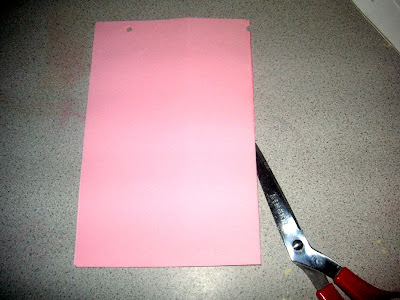 First I cut off the front cover. Then I trimmed the back cover to about 6.5" past the ends of the rings. I covered the cut edges with white duct tape. 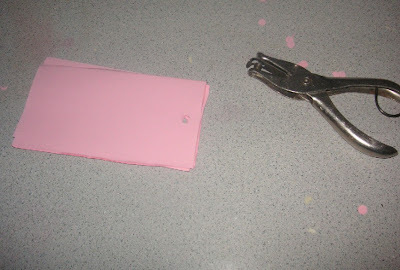 To cover without lumps, cut the excess at a 45 degree angle, with the cut flush with the corners. 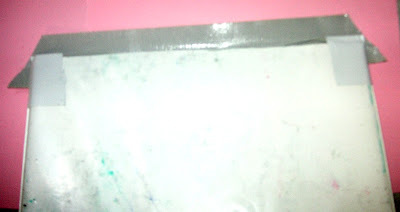 This picture is of the back (sticky side) of the tape, as seen from the back of the notebook cover. 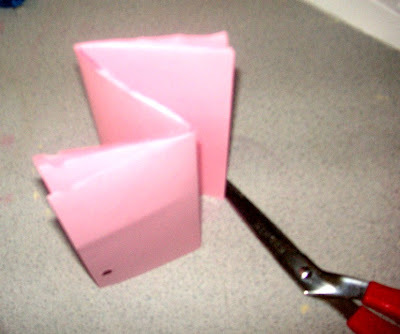 These flaps can then be folded (toward the viewer of this picture) on the back side, without lumps or wrinkles. 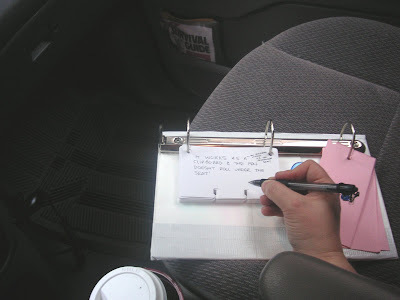 I wanted to have some real scrap paper in the car, too. This will be replenished from the backs of pages of junk mail and school fliers. 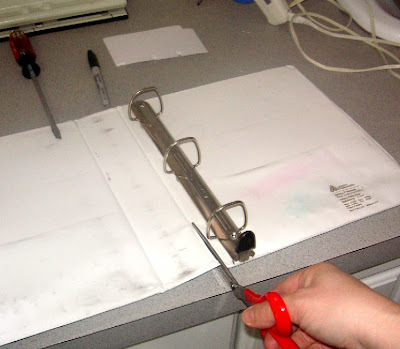 Each page yields 6 sheets, by folding in half width-wise, and then in thirds. The resulting pages are about 5.5" long by 2.7"
Just one hole punched in these, as they'll be hanging from the third binder ring. 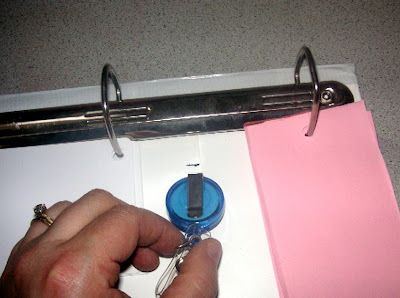 To keep the pen from rolling around the car, I attached it with a retractable ID card reel. 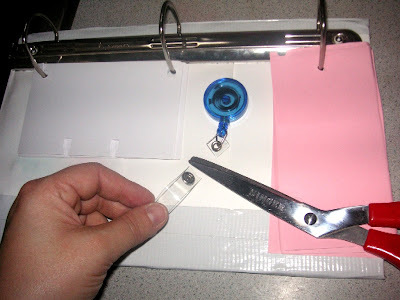 I marked the width of the clip on the badge reel and used a hand drill to make a hole that size. 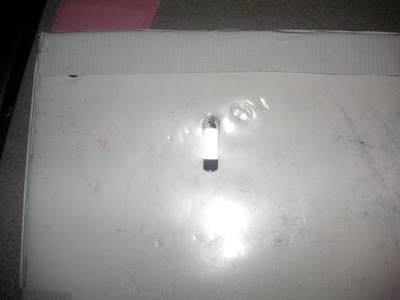 This is the badge clip, as seen from the back. 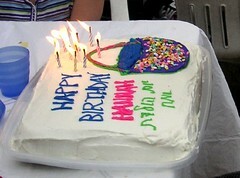 To hold it in place and keep it from catching on things, I covered it with duct tape on the back. 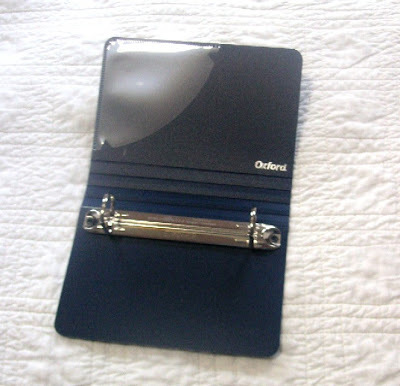 While the badge reel held the pen nicely, I wanted it to be more secure, so I cut off the snap, and threaded a twist-tie through the grommet and attached the pen this way. This part wasn't strictly necessary, but I anticipated children yanking on the pen, and wanted it to be as secure as possible. 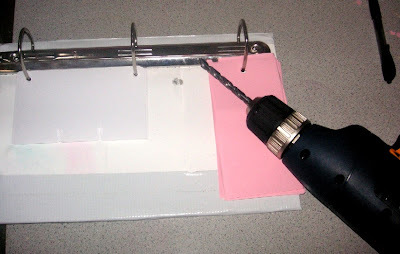 I even added a dot of glue from the hot glue gun to secure the twist-tie. 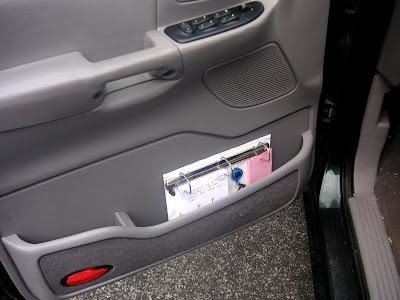 Here it is in action, as a clip board on the passenger seat (above), and in the driver's door pocket (below). And here it is on the steering wheel. 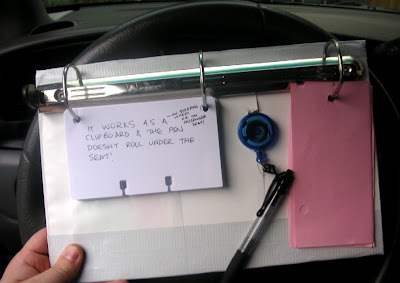 A full-sized clip board would be very uncomfortable on the steering wheel. This shorter version is perfect! Wondering where the rest of the notebook went? 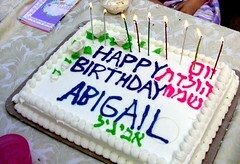 If you scroll to the bottom of this post, you can see it, covered with foil, masquerading as a cake platter. Brilliant! 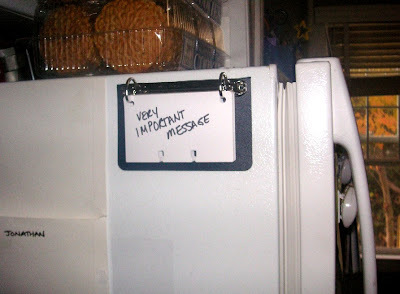 I love the fridge & car card holders. 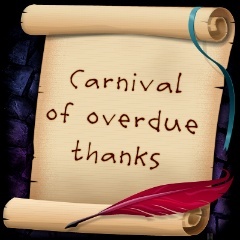 Thank you for cluing us all in! how do you have time to do all of this??? 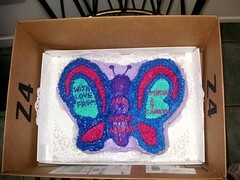 Thanks for taking the time to document & take pictures of this for us. Great photos! 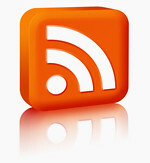 BTW, How about an update? How has this stood the test of time?